On our youtube channel “zookinesis49” I have a sample video of the “Native American Sacred Sweat Lodge Ceremony”. Several comments by Native Americans have expressed the view that this ceremony is only for Native Americans and other races should not be allowed to participate in this ceremony. This is my response to those comments. I am a teacher of Tai-chi-Chuan. In my efforts to become a better teacher of this system I spent many years studying the teaching methods of traditional cultures. Each of these teaching methods had a common goal – to help the student become more aware of the world of spirit both within him/her and in the world as a whole. Each taught how to participate in the common spirit of humanity, with its many expressions. While my goal was to specifically teach Tai-chi I realized that the other cultures I experienced had the same goal, although at the surface the paths to getting there were very different. Even different Tai-chi teachers have very different ways of expressing the same principles. When you become more aware of your spiritual nature, you become more aware of the common bond of all humanity on that level. You tend to become more open to and appreciate the diversity of humanity. Anger towards those who express their humanity in different ways seems ridiculous. There is a tendency in Tai-chi to just memorize forms or push hands techniques rather than to understand the underlying principles. In other cultures there is the tendency to emphasize the mechanics of a ceremony rather than the underlying spirit. (Not to say this is necessarily the case with those commenting on the Sweat Lodge video). I understand the desire (and need) to maintain the individuality of one’s culture and the pride in one’s culture, but at some point, doesn’t the awareness of the common spirit of all people play a part in the practices? Everyone who practices Tai-chi understands that it is of Chinese origin. No one thinks they are going to become Chinese by practicing Tai-chi. But people are attracted to this method for improving their health, their spiritual awareness and yes, their self defense. I don’t know of any Chinese person who says that only Chinese should be practicing Tai-chi. When my Jewish family and friends have our Passover ceremonies, we welcome anyone to the ceremony. We don’t expect them to become Jewish but are happy just to share the tradition with others. Their participation increases our pride. Both Native Americans and Jews faced a holocaust (although the Native Americans lost so many more millions) and I remember the anger my parents had towards the German people. But should a person of German descent want to participate in the Passover they would be judged as individuals – not on the basis of their background. 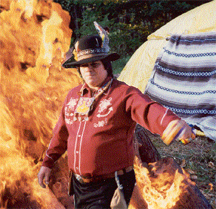 The teacher on the Sweat Lodge video is a close friend of mine of Indian background who loves his tradition so much that he shares it with others. His behavior is not guided by anger but by love and I believe that he has truly learned to express the principles of his Indian heritage in his everyday life. Certainly those who have known him and who have joined him in his tradition have benefited greatly. Some have been “stopped in their tracks” in the sense that they have suddenly understood how our society’s way of conflict and aggression have affected their lives. And their lives have changed for the better. Bill Elwell teaches with gentleness and humor. There is no pretense in any bone in his body. There is no reason to be angry with him. Certainly most cultures in the world have experienced violence against them and it is anger that perpetuates the violent feelings, if not the violence itself. Can we remember the common humanity that each tradition tries to teach us and not turn each tradition into another reason to separate ourselves from that common bond? There can be diversity AND unity. I would suggest that the central conflict in our society is not between the many cultures, but between those who would destroy the earth for their individual profit and those who would protect the earth for all creatures. It is not so much about protecting tradition against “outsiders” but of all people protecting nature. If we fight each other and hide our wisdom from each other, how are we to have the wisdom and strength to protect the earth? Many conflicts between cultures can be traced to small groups of people who profit off of that conflict. Let us not fall prey to that game! It is common, when an outsider visits a village, to “break bread” with that person; to offer them some of your food. Is the sharing of a ceremony any different? When I approach a person I am looking for the qualities of his humanness. Is he nasty and violent or is he kind and relaxed? Is he comfortable with himself or is he filled with unease? If he is a beautiful human being I want to know him and will enjoy spending time with him. When I see a ceremony I look for the same things. If it is a beautiful ceremony, expressing the best of the human spirit, I want to spend time with it. I don’t view a ceremony as a roll of money, to be hidden and kept away from others lest it be stolen. Its value to me is in what it expresses and how it leads us to our own humanity. To those who have made comments on the Sweat Lodge video on youtube – do your practices lead you to your own humanity and to the connection of your humanity to our common bond? We quickly get caught up in the everyday “struggle” of life and try to organize our lives into routines. These routines allow us to function automatically to get our daily tasks done efficiently. Yet the routines also make our lives robotic and drain us of the adventurous spirit that we may have had at a younger age. That spirit gave us energy and vitality. How can we re-capture that spirit while our lives are filled with many routines? Learning a practice like Tai-chi, Zookinesis or any other subject can provide us with a life-time of discovery. My mother went back to college when she was 65 years old. Many people asked her why she needed to go to college at that age. She explained that she needed her mind to be challenged in order to feel alive. My father used to say that when you stop learning, you die. Do you feel that you have learned as much as you need to, in order to live the rest of your life repeating cycles of routines? For many people life is a dulling process. Your spirit becomes duller each year until you die. Yet you can add an adventurous practice to your life at any time. Even if you spend just a few minutes a few times a week at your study or physical practice, it will add the spirit of adventure to your life. You don’t even have to excel at your practice. Simply being involved in it can change the “flavor” of your life. At many points in our lives, we often say, “I should have” learned this or that. Remember that today is a point in your life. Imagine what you would like to do. Think of what skills and other tools (such as knowledge) you would need to accomplish your goal. Then patiently acquire those skills and tools. Your life will begin to organize itself around your dreams instead of around your routines. This is the key to maintaining your vitality. Most of my students come to the school to learn a Tai-chi form or to reduce stress. They have a limited goal in mind. As they set about to accomplish this goal they discover the great depth of these training systems. They find that these studies are a path to self-discovery and a way to revitalize their bodies and minds. As their skills deepen, their goals deepen. The surprising thing to many students is how much self-discovery there is in every class. Breakthroughs in skills and understanding become so regular that they feel they are on a speeding train of self-discovery. And this is true no matter how many years they have been coming to class. There is simply a great distance for all of us to go to really develop our potential. It is the thrill of wondering what discovery awaits around the next corner that keeps them coming to class. Life becomes thrilling even in the midst of your everyday routines, which of course, you still have to do. One of the most important roles of culture in tribal societies was to unite the “sacred and profane worlds”. This means that in the midst of the everyday chores of life (the profane), our connection to nature (the sacred) had to still be the focus of our attention. Many ceremonies were carried out at regular times throughout the year to commemorate our connection to nature. These ceremonies were “routines” but ones that changed peoples’ focus from everyday problems to thankfulness to nature. We were reminded that the miracle of being alive overpowers any aggravations and sadness we may have. The dullness that has overtaken many of us is so profound that we are not aware of how much feeling we have lost. After I give a Tai-chi massage, the person usually says, “I feel like I’m really alive!” If I had asked them before if they felt alive they would have surely said yes. But after the massage they realize how much feeling they gained. Every little part of the body wakes up and is eager to participate in life. It is the difference between not wanting to get up in the morning and wanting to jump out of bed to start the day. The Zookinesis exercises are specifically designed to develop feeling and skill in each joint and muscle of the body. They are imitations of animal movements. Connecting your mind to your body is another way of making your life “sacred”. Many peoples’ minds spin all day. This uses up a lot of energy and doesn’t accomplish anything. Connecting mind to body ends this useless spinning, which is just mental routines that have gotten stuck. When the mind functions in endless, repeating routines, our lives duplicate the patterns of the mind. By connecting mind to body, we become more creative and our lives more exciting. Many people feel that their lives are exciting because their routines exhaust them. They feel that if they are tired at the end of each day, that’s all the excitement they can take. Yes, routines can be exhausting but they are depleting to the spirit as well. Somehow the excitement of learning new things doesn’t deplete you. You may be so worn out after Tai-chi sparring practice, for example, that you fall down to catch your breath, but within a minute you are ready to get up for more sparring. I often used to be tired when I began to teach sparring but after two hours of sparring, I was invigorated. It is an illusion that you are too tired for your practice. Practicing Tai-chi, Zookinesis, Pilates or any other such activity refreshes you. Whatever time and energy you put into it is more than re-paid by the energy you get out of it. I have often thought that living a life of routines is like spiraling down a funnel into death. Life can be a spiral upward towards more vitality, skills and knowledge. It doesn’t even take much time each day. Starting a practice or study can change the entire nature of your life. The element of metal, in the Chinese teaching of the elements, represents, among other things, the human spirit. This spirit is represented by the sword. The art of sword making refines the base ore into the refined metal, which is what we are trying to do in our lives as we develop our character. The sword serves the same symbolic purpose in many cultures. In the Kung Arthur legends, for example, the sword can be thought of as one’s life. It comes from the Lady of the Lake, representing the Great Mother and at the end of the legend, returns to the Lady. This legend can be thought of as the story of how this sword is used and misused by the legend’s characters. In our own lives we are influenced by many people and groups, each vying for our allegiance. We are sometimes misused by these people for their own petty purposes. Merlin thrust Ex-Caliber (the sword in the Kung Arthur tales) into a stone when it was misused. It could only be removed by a “good person”, the rightful king (which was Arthur). When we are misused it feels as if we are embedded in stone and only a “good person” can get us out of this state. Some people try to impress us with their power but it is the spirit of the person that frees us. The Kung Arthur tales took place at a time when the “old ways” were giving way to the “new ways” (paganism giving way to Christianity) and the legend was based on this transition. In our modern times many people also feel old ways giving way to new ways. The old ways can be thought of as living a sacred life, a spiritual life. This means that much of our focus is on our own inner development, the development of our character. The new ways are all about getting ahead, owning things and eliminating the “magic” from our lives. Many people feel lost in this “new world”. It is no longer a Pagan vs. Christian conflict. People of all faiths and no faiths are equally concerned. While the sword represents the spirit, it is a weapon. Our spirit is our greatest power to live an enjoyable, positive life. One of the first lessons in sword fighting is to be constantly on guard not to let anyone take your sword away from you. How often during the day is our spirit taken away from us as we worry about all sorts of things? When we worry we are doubting our power to take care of the situation. We doubt the power of our spirit to get us through difficult situations. How often during the day do we encounter people trying to convince us of things so we can join their crusades? The sword-bearing Knight of the round table must have guiding principles to use his power, based on helping his community, otherwise he would just be an armored bandit. His common sense and sense of justice must guide him. When we see news of powerful people using their money and position to rob ordinary people of their life savings in order to make a few more hundreds of millions of dollars, we often wonder what would we do if we had power. We do have power. Even though our little spirit sword may not seem as powerful as the resources of a billionaire, that belief is one of the ways we are robbed of power. It was not King Arthur’s strength or wealth that made the legend what it is. It is the idea that he was a just and fair king. Developing our character may seem naive when the level of corruption in our country seems so much greater than ever before. Yet, with all of their power, what really built the Knights up and brought them down was their character, and that was what the legend was all about. With all of Merlin’s magic, he was at the mercy of the inner spirit of the kings. Neither he nor Ex Caliber could do anything by themselves. Take note of all the distractions in life – new computer programs you need to learn, new inventions you have to learn how to use, the news of wars and tragedies on television, your friends’ problems, the creditors threatening to turn something off, your own health problems. That is the fire that forges the metal for your sword. Without it you would have a sword made of rough ore. When each of these distractions meets you, remember your power. Use the “opportunity” to forge your sword. Don’t let the distractions steal your sword. Forging the sword involves both heating and cooling. The red-hot sword is plunged into water. Remember to take some time each day to cool (to practice Tai-chi, Zookinesis or meditation). The balance of fire and water strengthens the sword. Ultimately, worldly power such as money cannot bring you an enjoyable life without inner power. Be the good and fair king in your life. Then, whatever worldly power you have, will be a blessing to us all. American Indians use the drum as a form of meditation and as a metaphorical representation of the development of consciousness. Imagine a hand-held drum made out of a six-inch wide ring of wood. An animal skin forms the head of the drum. A long strip of leather winds in and out of holes drilled into the ring of wood. The leather strip crosses the inside of the drum at many points, weaving through the holes on the other side of the ring. The result is that on the inside of the drum, you have many strips of leather across the center. The drummer holds the place where the strips cross. Imagine that the ring represents the world and that each strip across the inside of the drum represents one aspect of our being (one “element”). One may represent the body, another the thinking mind, emotions, will, memories, the senses, creativity, attention, etc. When you hold the drum at the center, you are “balancing the elements”. This means that you are controlling the relationship among all these aspects of your being. The beating of the drum represents time. The sound that results represents how your individual spirit (individual Tao) creates the quality of your life, as you live your life through time. The drummer varies the tightness or looseness of the various leather strips as he or she drums, to vary the sound. This represents the way we can be creative with our spirit in the way we interact with the world (the wood ring of the drum). Drumming then becomes a beautiful way to understand how we form our lives by creating a cohesive feeling of who we are (represented by the center of the strips that the drummer holds) based on the relationship of the elements. Each person usually emphasizes one element more than the others and uses that element as the center around which the others are balanced. For some, the thinking mind may be the most important element. For others, it is the emotions. The skill in balancing the elements in all ancient cultures is to keep all the elements balanced. Yet I have found that in all the cultures I have studied, one element is considered the best to use as the balance point. Those of you who have followed these weekly lessons will not be surprised to read that this element is, attention. It is consciousness itself. Balancing the elements really means paying attention equally to all the aspects of our being. We need to pay attention to our physical health as well as our mental development as well as our emotional balance, etc. Within the body, we need to pay attention to all those muscles, joints and other parts, making sure that each is relaxed or flexible or whatever quality that part needs to have to function well. We too often neglect our bodies in general or, even if we exercise, we may not practice an exercise that works all parts of the body and relaxes as well as strengthens. The drum analogy also points out another aspect of training that is important in Zookinesis and Tai-chi. Those strips across the back of the drum are constantly varying in their tightness and looseness. The drum wobbles back and forth to create interesting sounds. Too often we get stuck in one dynamic of how those elements behind the “drum” (behind our everyday lives) blend and play with each other. We become rigid in our thinking, in our emotional state and other qualities and loose our creativity. The “sound” that comes from our lives becomes a dreary beat of time leading to our sad deaths. The alternative is to live our lives as if we were creating joyful music with each day. What can you do this day to be creative with your life? It may be something small, such as eating a different breakfast than usual. But if you get used to asking yourself how you can be creative each day, that will gradually bring creativity into your life. It will bring your attention to how you can use the elements to live a creative life. That hand that grabs the center of the leather strips and plays creatively with them, is you. It is the interaction of attention and creativity, the interaction of yin and yang. Attention centers. Creativity varies. We may complain that the everyday problems of life make it hard to stay with our practice. We just don’t have the time or energy. Let’s go back to the drum. We have the drum and the hand holding the drum. Yet can it make a sound without being hit? The stick hitting the drum is the everyday problems and activities of life. The resulting sound comes from the interaction of how we “hold” our spirit and how the everyday activities of life resound on that spirit. In this way, drumming represents life itself. When you listen to a drummer or to any musician, you can tell whether he is playing from his spirit or if his music is just technical. He may be technically proficient but that alone will not stir an audience. You may have another musician who is not all that great technically but his spirit shines through the music. We can forgive the lack of technical proficiency. The lack of spirit is harder to forgive. In the same way there are people who are very proficient at certain elements. They may be good at acquiring wealth or have great knowledge. But what is the quality of their spirit? Each of us has a great wealth. We have the wealth of our attention and creativity that is given to every person in the world. We can stay centered (not give in to anger, greed or jealousy) and be creative (love the challenge of doing the most with what we have). We can make every day of our lives an act of balancing the elements, of facing the problems of life with creativity. That stick will continue to hit our drum but we can determine what sound it will make. When we practice our Tai-chi form or Zookinesis exercises, remember the interweaving strips that meet at the center behind the mechanics of the movements. Bring your attention to the center and from this center, be creative. At one moment your mind may kick in, the next moment, your emotions or your will or a memory. Allow this interplay with the elements but don’t shift your attention from the center. The interplay of the elements should not be suppressed as long as your attention does not get pulled by any one of them. Sometimes an element may try to steal the attention from the center. A thought, for example, may try to convince you that you need to pay full attention to it and abandon the center. You can develop the ability to quietly be aware of the “antics” of the thinking mind without getting caught up in them. You are like the parent, watching the antics of a child and the thinking mind is usually very much like a child. It wants all of your attention and does anything it can to get that attention. It is jealous of any attention you give to any other part of you. For many people, the elements of their being are very much like jealous children and there is chaos inside of them. The practices of Tai-chi, Zookinesis and drumming are designed to create harmony where there was chaos by keeping the attention centered and creativity active. I love studying how other cultures try to achieve the same results as the Taoist culture. The teaching techniques may vary but the goal is obviously the same. The external harmony of music not only reflects the internal harmony of the musician but also resonates a harmony in the listener. When you see a Tai-chi practitioner doing a Tai-chi form, that also resonates in the viewer. Harmony is the interplay of centeredness and creativity. If everyone in the world had such a practice in their lives, how the world could change for the better!